VMware Data Protection released recently has fixed several bugs and introduced several new features, like restore rehearsal – a feature that you might know from VDR. Another feature adds is the ability to clone backup jobs, or the possibility to configure some post tasks behavior like for example, automatically power on or reconnect a specific virtual NIC. How to upgrade VDP? Not very difficult, you'll be able to follow the upgrade steps in today's article. One thing that might push you to upgrade your VDP appliance is the fact that the latest release fixes the annoying bug with 2008R2 VMs that had the error which needed to modify advanced parameter of VMs: disk.EnableUUID=false in the VMX configuration file as I reported on that here. The latest release of VMware vSphere 5.1 U1 feature and enhancements – check out my post. New Log Tab – with more details on logs. New post restore tasks – ex. connecting specific virtual NIC, or start after restore. 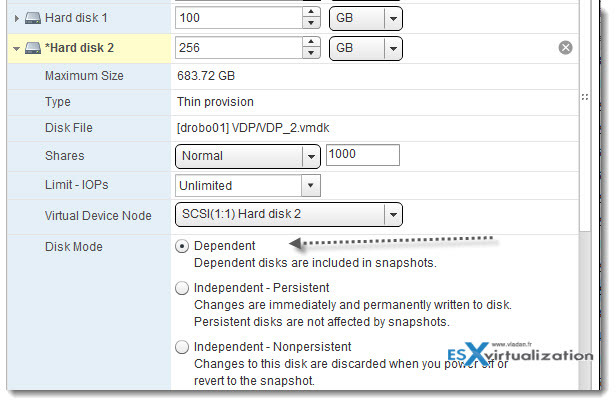 New VDP migration utility – allows migrate backup jobs (with data) to another VDP appliance. Note that this feature is only available in the VDP Standard (not the VDP advanced)! The upgrade process is documented in the vSphere Data Protection Administration Guide, but as I was testing the upgrade in my lab, I thought that it might be the good idea to show it off. Right click VDP VM and take snapshot > give the snapshot a name, with description. Start the VDP appliance > it should boot on the iso. With your web browser open https://<IP_address_VDP_Appliance>:8543/vdp-configure/ and login with VDP user name and password. Check all the services on the Status tab, if there are one or two not running try to start them. Make sure all the services are up. And then, you'll see a progress bar, where at first the packages gets uncompressed first, before proceeding with the upgrade…. Part Three – ensure that the upgrade went ok and remove snapshot created previously. That's it, you now have upgraded to the latest release of VMware VDP. vSphere Data protection with its latest releases introduced quite a few new features and fixes. It's variable length deduplication capability allows some huge space savings. A production ready product? I still have that feeling that many users and organizations (especially larger shops) prefer using other backup products dedicated to backup their virtual infrastructure. Those products usually offers not only backup, but also replication features, plus more advanced (and very useful functions like powering VMs directly from backup location in order to speed up the backup process (Veeam, PHD Virtual….). But VDP is included in the vSphere Essentials Plus bundle, so why not using it for backing up if in smaller environments, and use vSphere Replication – the product bundled from vSphere Essentials Plus and higher packages. I followed the steps, made the snapshot, got to the upgrade, and it still says “No Snapshot: Please create a snapshot before trying to upgrade.” I confirmed the snapshot exists in the Snapshot Manager, even tried another one just to make sure. Tried removing snapshots and recreating; tried Consolidating, then another new snapshot. Every time, it still tells me “No Snapshot” when I try to upgrade. Any suggestions? Found it. My vCenter Server upgrade (5.1 -> 6.0) somehow dropped a bunch of my user permissions, including the user for the VDP server. Once I re-added the user permissions in vSphere, the upgrade worked. Thanks for your info!